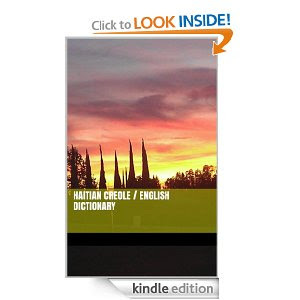 HaitianCreoleMP3: Learn French and Creole Online in No Time! Koute Kreyol - Listen to Haitian Creole - Free Lesson Audio. The above audio contains this text. Pou fè manje ak pwason, ou bezwen sizonnen pwason an avèk lay (garlic), pèsi (parsley), zonyon vèt (green onions), sèl (salt), yon ti kiyè lwil oliv (a T spoon of olive oil), mwatye yon tikyè ji sitwon (half a tsp of lime juice), piman pike (hot pepper). Kòmanse manje bannann ak pwason! Gade byen: Pwason pa pwazon (Fish is not poison). Ki jan yo prepare bannann an Ayiti? Fri bannann pou ou ka manje-l avèk pwason (Fry plantain so you can eat it with fish). Ayisyen rele sa bannann ak pwason! (Haitians call that plantain with fish). Itilize yon pèz bannann pou peze tibout banann yo (Use a pèz bannann (squeezer) to flatten the platains). Akasan se yon bwason Ayisyen. Li fèt avèk mayi moulen (corn flour), lèt (milk), anis (star anise), kanèl (cinnamon), epi sik (sugar). Ou bouyi-l jiskaske li pare pou bwè. Learn Haitian Creole Online + French with Haitian American Educator Joseph J. Charles, MS - Learn Creole Audio with Free Downloads of "Sa'k Pase? N'ap Boule Textbook" - Haitian Creole Podcast to Help Rebuild Haiti, Haitian Creole for Aid Workers, my Children, Doctors, Relief Workers, Missionaries, Haitian Quake Survivors, Speak Haitian Creole in No Time.